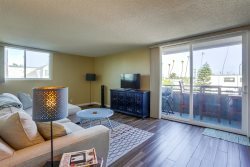 Enjoy this newly remodeled, luxury, two bedroom, two and a half bathroom, ground-floor, ocean front condo in South Mission Beach. Stunning ocean views await from the entire ground floor, the master bedroom and also the second floor bedroom. 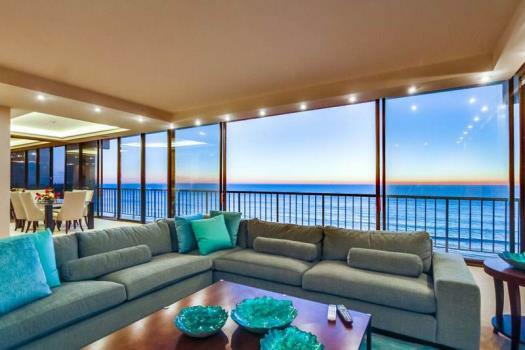 Featuring beautiful new flooring throughout, a remodeled living room with gorgeous modern furniture and fireplace, plus amazing ocean views, this condod is the perfect oceanfront getaway. Additionally, both bedrooms, bathrooms and the entire kitchen have been fully remodeled and upgraded. Finally, the expanded patio includes a barbeque, relaxing furniture, and is located steps from the white sandy beach and volleyball courts. Garage Dimensions 92 in. wide, 35 ft. deep and 6.5 ft. tall. Maximum 6 guests, non-smoking. NO A/C. Everyone was great to work with, very helpful!